When Far Cry developers Crytek bought shuttered British studio Free Radical, many wondered how long it would be until we saw the return of the Timesplitters franchise. That time may be soon. According to a report on Eurogamer, Crytek UK - as Free Radical is now known - is "talking with various publishers about the possibility of creating a brand new TimeSplitters game". "We're talking to publishers at the moment about whether that's [TimeSplitters] a viable route or not," Crytek UK's Karl Hilton tells Eurogamer. 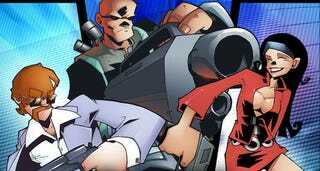 "There hasn't been a TimeSplitters game for quite a while. Obviously TimeSplitters is a FPS with a strong multiplayer element. The question is, is that the way to go with another one, or should it go down a different route, or should we be developing a new IP altogether?" I'd say go with Timesplitters, thanks. Though just in case the studio does decide to go down a different route, the studio is also shilling to publishers "a single-player and multiplayer first-person shooter" based on new, original IP.